2005 – 5 Cents- Philadelphia Mint – U.S.A. Interesting Facts – The 1938 through 1942 D versions of the nickel are also made of the same composition, but generally are sold for a premium over their melt value due to rarity. 0,05053606 was the melt value on December 18,2011.As of March 14, 2011, the value of the metal in a nickel is $0.0665396, 33.07% more than its face value. 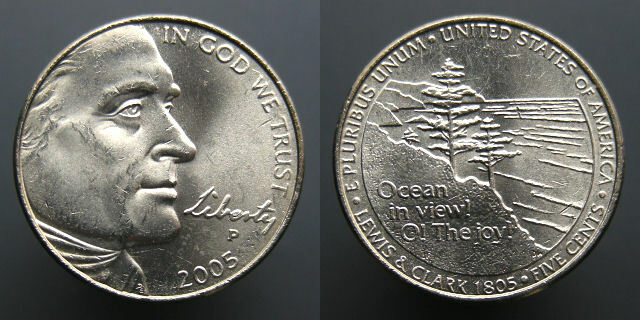 2005 – 5 Cents – Philadelphia Mint – (Ocean In View Series) – U.S.A.
Obverse – Thomas Jefferson, 3rd President of the United States and author of the Declaration of Independence. Reverse – Westward Journey Series including “American Bison” and “Ocean in view! O! The joy!”. Tags: 2005, America, Cents, CoinsUniverse, Jefferson, Philadelphia, U.S.A.